A private resort for a big family. With 4 bedrooms in the main house and 3 bedrooms in the annex, a very large garden, a pool and a cubbyhouse. Less than 5 minutes walk to Raintrees shopping centre and 10 minutes drive to the city. Part of Pandanus House, Breadfruit Studio is a well equipped and user-friendly studio in the highly sort after Whitfield / Edge Hill area. The location is popular because it just 5 minutes from the city and being on the hillside catches the cooling trade winds. Whitfield and Edge Hill are the dress circle of Cairns. 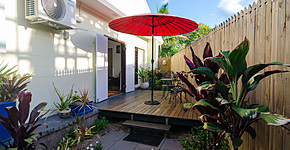 Pandanus Holiday House is a fine lowset timber Queenslander 1km from the cluster of cafes and restaurants surrounding the 5-ways village hub of Edge Hill. 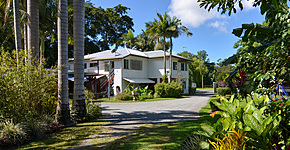 Book Breadfruit and Gardenia Studios for 1 or 2 extra bedrooms. 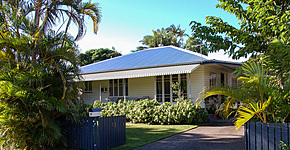 A timber "Queenslander" house with a family friendly layout and tons of space. 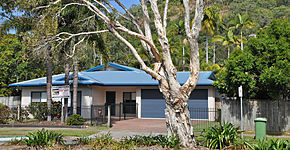 Conveniently close to the city - just 5 minutes by car to the swimming Lagoon on the Esplanade.